On the animation side of things, Houdini viewport now supports onion skinning with the option to set a number of before and after frames. There are also improvements in the Dope Sheet, with the addition of a ripple tool and the ability to box select keyframes. In the curve editor you can set automatic slope and also cycle animations beyond the keyframe range. But the bigger additions are on the character animation side of things. There are two new simple rigs that have been added, one for male and one for female. Both rigs have onion skinning and render as subdivision controls. They also have squash and stretch controls. Dual quaternion skinning has been added for better skinning and deformation of characters. There is also a new character picker pane and a pose library pane. All the simple rigs have built-in poses and can be displayed in the character picker pane. 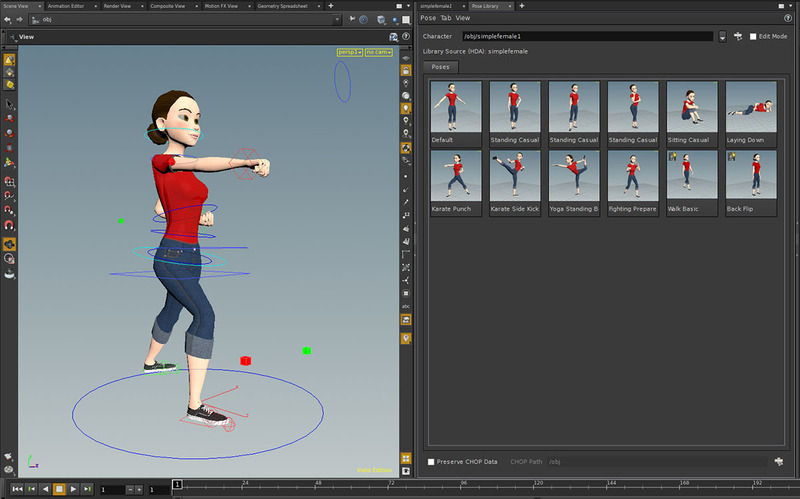 The Pose library pane is fairly simple to use and also allows the user to save and load custom poses. In Houdini 15, there are new shelf tools for setting up Viscous fluids which allow the user to generate Lava and also Melt objects. Even though this could be done before, the shelf tools make it a lot easier to setup. This is done using the new Gas Temperature Update node, which allows the user to set a cooling rate for the liquid which solidifies the liquid over time. 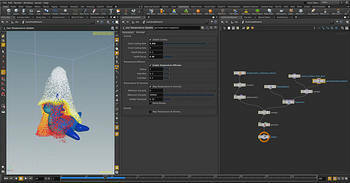 Also using the shelf tools for heat and cool object the user can transfer temperature from an object to the liquid. This allows the user to melt something when it touches another object, like a hot knife going through butter. To support this there is also a new Lava shader which helps make the rendering process simpler. The Lava shader uses the new Principled Shader which I will talk about in the rendering section. 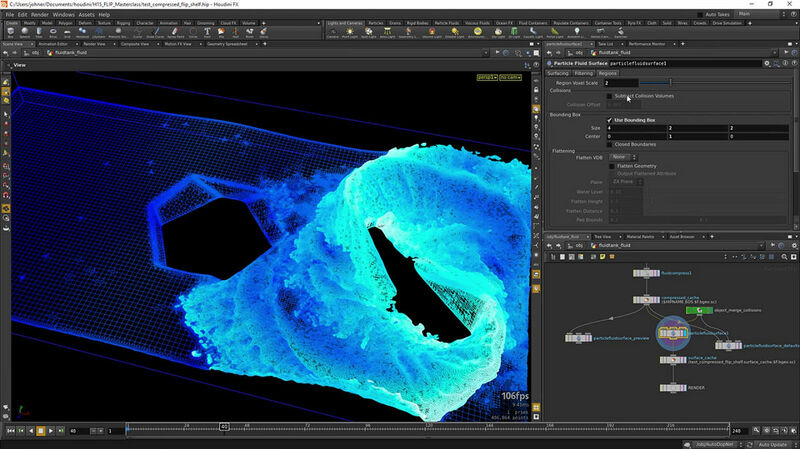 In order to facilitate very large scale fluid simulations, Houdini 15 has added a new Fluid Compress node which allows the user to radically reduce the number of particles and voxels that are stored to the disc without losing any details of the simulation. This helps in saving disc space and overall memory consumption. This has been coupled with a brand new Particle Surface node which can use the compressed fluid data to build the fluid surface. It also has a bunch of previewing options for faster playback in the viewport which include culling the particle data using a bounding box or the camera frustum. The surfacing of fluids has also been improved by allowing the user to generate masks for the fluid smoothing operations so that you can maintain a higher density mesh where there is a lot of movement in the fluid but drastically reduce the mesh where the fluid is calm. The white-water system has also been improved. It allows the user to reseed the compressed fluid data to generate underwater bubbles and stuff and it also allows for distribution of the white-water simulation on multiple machines based on the camera frustum. Distributed Sims have also been improved. Flip Solver now has a global pressure option so that there are no artifacts at the seams in distributed sims. Side Effects says that the Fluid System is now capable of simulating over two billion particles. Of course, I haven’t really tested this since I don’t have a super computer at home. But the point being that everything has been improved to make it as memory efficient as possible to facilitate very large simulation, in case you ever want to make 2012 Part II. The biggest addition to the Crowds system is Ragdoll dynamics which uses the Bullet Solver. The new Collision Layer and Collision Joints tools help the user setup the collision joints and rotation limits for the ragdoll. These are fully capable of interacting with fire, smoke and sand simulations. The FEM solver is said to be, in certain scenarios, up to 10x faster than Houdini 14. Even though on a simple scene created in Houdini 14 with the pig head as a Solid Object and re-simulated in Houdini 15, I didn’t really notice a very large speed difference. The viewport playback speed, however, has been vastly improved from version 14. 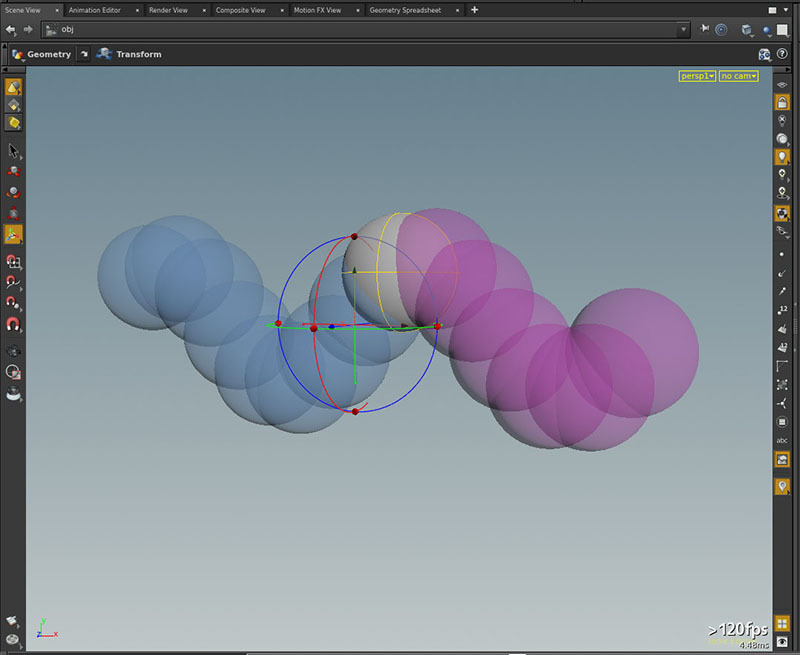 The Solid object and the Cloth object now have new controls for self-collision and the viewport is much faster when displaying large number of tetrahedrons and polygons. Also Solid Object now uses separate geometry for simulation and rendering. This is done using the new Solid Embed geometry node, which is a digital asset that encapsulates the older Remesh tool. This method is called embedding and there is an option in both the Solid object and the cloth object to turn it off and use the actual mesh itself. However, when using the embedded method there can be a really good increase in speed since you end up calculating on a much lighter mesh and then transferring the deformation to your original heavier mesh. The POP solver now has the option now to put particles into auto-sleep and can be woken up using the POP awaken node when close-by particles or objects start moving. This is really helpful when dealing with very large Grain simulations. This way only the particles closest to a moving object will get simulated and the others will remain dormant.